Please refer to our stock # 9847 when inquiring. 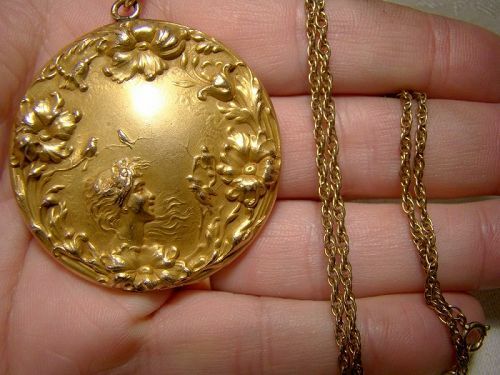 An ornate Art Nouveau gold filled photo locket on chain necklace with maiden circa 1900. This late Victorian 1-13/16" diameter locket has high relief decoration including a maiden and a poppy flowers border. The back has an ornate AJM monogram and the interior has two photo retaining bezels and one celluloid window. It is gold filled and unsigned and it comes with a later 24-1/4" long and 1/16" wide rope twist gold filled chain with a springring clasp. This attractive pendant and chain is in excellent condition with no dents, bends, corrosion, damage or repairs. All items are thoroughly and conservatively graded and all condition issues are noted; all items are vintage or antique and may have slight signs of gentle use. Expedited tracked and insured parcel shipping to the U.S. starts at $22 (other spots may vary, air is higher). Items paid with a credit card will be shipped to confirmed addresses only. We do ship internationally. All of our prices are in $US. PLEASE NOTE: We DO NOT accept PayPal.